Size specification: The first measurement gives the width of the impulse heat sealer. Adjustable timer controls to suit a wide variety of films from 2 x 25 microns (2 x 100 gauge) to 2 x 200 microns (2 x 800 gauge). Heat sealers with no cutter are ideal for sealing bags. Heat sealers with cutter are used for sealing layflat tubing rolls. Please choose width that is wider than the layflat tubing being sealed. 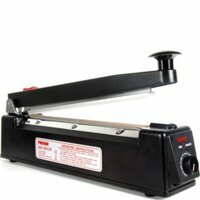 Impulse heat sealer forms a tight, secure seal on polythene and polypropylene film with no warm-up necessary. Buy quality layflat plastic tubing. Buy quality plastic chair covers. Further discounts available on larger orders. Other sizes also available. Email sales@polybagsdirect.com or call 01162 221 723 for advice on your packaging needs. Electricity is used only when impulse heat sealer bar is down creating a 2mm seal. We use a secure 128 bit e-commerce server. All VISA, MasterCard and debit cards accepted. No PayPal account required to process your order. We express deliver to all mainland UK cities. Please contact us via email or phone to confirm delivery cost and lead time for oversea deliveries. Please refer to our delivery guide for further details.